Michael Lorenzini strikes a forehand. The junior and the Wildcats went 1-2 on a busy weekend. This weekend, Northwestern notched two victories against Big Ten foes Purdue and Indiana. Friday night featured a 24-16 victory by the No. 19 Wildcats against the No. 22 Boilermakers (8-7, 2-6). 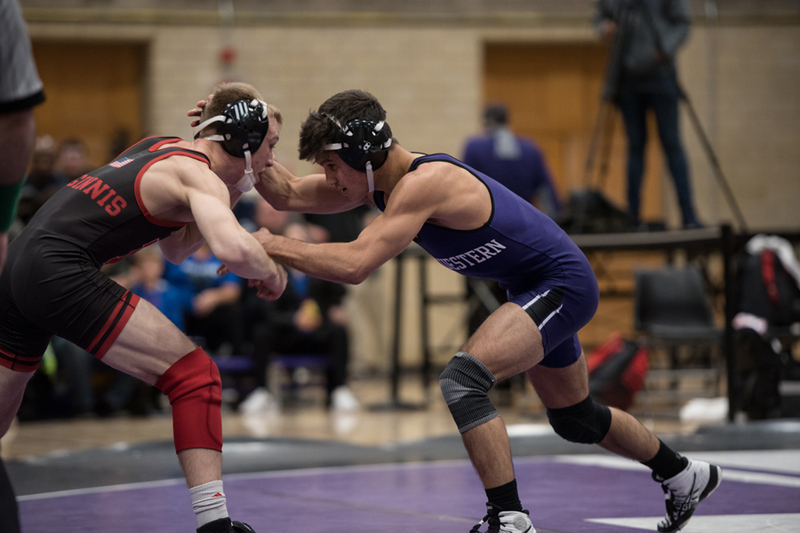 The second match of the weekend ended with a second NU (9-4, 5-4) win by a score of 27-12 against the Hoosiers, wrapping up the Big Ten dual season Sunday morning. The Cats had five individual wins Friday night — by ranked redshirt freshmen No. 5 Ryan Deakin and No. 10 Sebastian Rivera, junior Conan Jennings and sophomores Zack Chakonis and Shayne Oster. Oster, wrestling in the 157-pound division, won by a pin and said his win will help him gain some momentum going into the postseason. And capitalize on Purdue’s mistakes NU did. Jennings, who is unranked, beat his No. 15-ranked opponent Shawn Streck in the heavyweight class and Rivera followed up by dominating No. 17 ranked Luke Welch in the 125-pound division. By beating the Boilermakers, the Cats grabbed their third victory over a top-25 opponent this season. Chakonis, who also notably won Friday with a pin in the 197-pound weight class, echoed Oster regarding the need to be offensive throughout the bout and said success would come with that plan of attack. NU picked up its fifth Big Ten victory, its most in a season since 2011, on Sunday at Indiana. The match was marked by seven individual victories including two pins, this time by Deakin and Rivera. Deakin, wrestling in the 149-pound division, had his fastest pin of the year, defeating his opponent in 1 minute and 21 seconds to tally his team-high seventh win by fall this season. Rivera pinned his opponent in the second period, with a fall occuring at the 4:11 mark. Coach Matt Storniolo said it is essential for the Cats to be the aggressor in their matches as only one dual against Southern Illinois-Edwardsville remains prior to Big Ten Championships.